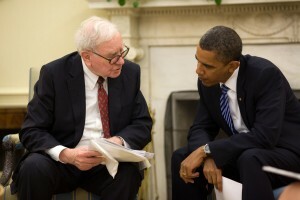 The current version of the “Buffett Rule”, as proposed by the Obama Administration today, would create a minimum tax of 30% on individuals with income over $1 million. The long term capital gain tax rate is 15% (for most individuals). This is the rate paid on most of the income that a business owner receives when they sell their business. If the proposed “Buffett Rule” becomes law, this would be an effective doubling of taxes paid upon the sale of a businesses over $1 million. This should be a wake-up call for all small and medium-sized business owners. While there is no guaranty the “Buffett Rule” will become law this year, even if it doesn’t, it will certainly continue to be brought up as a “solution” to raise more revenue for a federal government that can’t pay its bills. Someone once said, “It’s not what you make…it’s what you keep.” Properly timing your sale can mean keeping more of your hard-earned money. Private equity has nearly half a trillion dollars looking for businesses to buy now. Improved PE returns signal an improved environment for business owners looking to sell in 2011. There is a lot of confusion out there about business appraisals. And no wonder. Many of the so-called “experts” are the ones doing the confusing. So here is a quick guide to business appraisals for privately-held businesses. There are two basic types of business appraisals: Compliance Appraisals and Market Appraisals. Compliance appraisals are performed to comply with the law. Typically tax law. Compliance appraisals are required to calculate federal (and state) gift and estate taxes. IRS Revenue Ruling 5960, established the concept of “fair market value”. In practice, however, decades of court rulings and precedent have reduced the concept of fair market value to a series of “calculations” based on flawed assumptions, and consequently, have little to do with true market value. Most certified public accountants and tax attorneys that provide business “valuation” services for their clients, are performing compliance appraisals. While compliance appraisals are certainly necessary to comply with tax law, they are not to be confused with market appraisals. Market appraisals are performed to determine the market value of a particular business to a hypothetical buyer, given a set of circumstances. As mentioned earlier, the term “fair market value” has nothing to do with actual market value. The only way to determine market value is to look at the market for similar businesses. Similar to the way real property is valued, a market value appraisal of a business must look at comparable sales data, either individually or in aggregate, to properly estimate the market value of a subject company. So if you need to comply with the law, get a compliance appraisal. If you want to know the value of your business, get a market appraisal…and by all means…hire a professional who knows the difference between the two. Is 2011 The Year To Sell Your Business? Is this the year to sell your business? Maybe yes. Maybe no. As with most complex situations…it depends. In general, we think selling in 2011 will be better than 2010. Will 2012 be better still? We don’t know. It could be better. It could be worse. Predictions are difficult….especially the further out you go. For now, let’s stick with 2011. #1: Senior debt lending is thawing a bit. It has been a difficult two years for prospective borrowers…especially if you were trying to borrow on cash flow alone. There are signs of improvement. Will it be like 2007…no. It may never be like that again. At least, not for a long time. Of course, more senior debt from the lender means more leverage for the buyer…and the ability to pay more for your business. Imagine that. #2: Private equity has lots of money to move. They have to…or give it back. We think they’ll find ways to move it. One way is just to put more money in each deal. According to one source, in 2009/2010, private equity was putting in an average of 55%-60% equity, and pricing deals at 25% returns. Seems aggressive. Maybe too aggressive. But it depends on which side you are on. Lower required returns mean the PE firms are willing to pay more for your business. And it looks like lower returns are here to stay…at least for a while. Bad for private equity investors. Good for private business owners. #3: Good businesses are getting harder to find. At least, that’s what we see. PE firms are getting more desperate. What was a $2M EBITDA floor in 2007 is now $1M…or less. Some are entertaining deals as low as $500K. Warts too ugly to touch in years past are now mere blemishes that can be easily cured. That’s what they tell their investors anyway. Bottom line…if you have a good business, you can be at the center of attention. So is it time to sell? Again…it depends. If you have health problems, you are burnt out, or you just can’t grow your business anymore, it’s always time to sell. Holding on is never the right answer. And it usually ends badly. Question #1: Is your business growing despite the economy? Question #2: Would you prefer to sell your business sometime within the next 5 years? If you answered yes to BOTH questions, then 2011 is probably the year to sell. Why not wait until 2012 or 2015, you ask. Too risky, we say. There are always risks in running a business. But we see lots of risks beyond the normal ones. Risks you can’t control or easily mitigate. Of course, these are complicated matters. No two businesses are alike. No two business owners are alike either. We find it’s better to talk these things through. Go over your options. But we also find that 9 times out of 10, owners wait too long to sell. It’s an awful regret to carry.